After my son went to the Mark Cresse School of Baseball, he definitely changed for the better! He was activated! I think it was the best thing for my son! He found baseball! Thx Mark! 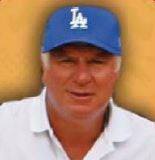 In 1984 I was entering my 11th season serving as the bullpen coach in the major leagues for the Los Angeles Dodgers working under Hall of Fame manager, Tommy Lasorda. I would go on to coach 26 years for the Dodgers and coach in five World Series and be lucky enough to win two World Championships in 1981 and in 1988. I was also selected to coach the National League All Star Team five times during my career and we beat the American League All Stars all five times. In 1984 my son, Brad, was six years old and was very excited about learning how to play the great game of baseball. As is the case with every parent, I wanted to see my son have the best opportunity possible to enable him to achieve his dreams. Since I was coaching the Dodgers during the same time that my son was playing his youth baseball season, I was not able to sign up to coach his team. When I saw the caliber of coaching that he was getting, I decided that something had to be done. I started my Mark Cresse School of Baseball so that I could ensure that my son would get the best coaching possible that I could hire. My first camp took place at the Robinwood Little League complex in Huntington Beach. We were the only baseball camp operating at the time in Orange County. I hired a group of high school and college coaches and set up a program of training similar to the one we still use today. It worked. Not only did my son continue his love for baseball, but the camp became an important part of thousands of youngsters that wanted to learn to play baseball at a higher level. We taught campers that barely knew how to put their glove on their hand how to play, we taught marginally talented campers how to play better and we taught exceptionally talented campers how to excel. During the 80’s we had players like National League All Start, Craig Wilson of the Pittsburgh Pirates come to camp. We had Gold Glove winner JT Snow of the SF Giants come to camp. We had All Star MVP, Michael Young of the Texas Rangers come to camp. We had National League MVP, Jeff Kent of the SF Giants come to camp and we had Hall of Famer, Mike Piazza of the Dodgers and Mets come to camp. In all, we have had close to 30 campers that came to our program and have gone on to play in the major leagues. We have had hundreds of ex campers sign professional contracts and thousands that have played in high school and college, but one of my favorite things is when I get a letter that says thank you for giving my son or daughter the love of the game and the improved confidence that attending my camp gave their child. I have been in the baseball camp business now for over 30 years. Since the story started by me telling you how I did this all for my son, you might wonder how he did? Brad had a great high school and college career. After finishing his high school career in 1996 at Marina High School where he was drafted by the Dodgers, Brad decided to go to college in Baton Rouge, Louisiana to LSU. At LSU, he was first team All American three years. He played in the College World Series 3 of his 4 years in college. LSU won the national championship in 1996 and in his senior year in 2000. He drove in the winning run in the bottom of the 9th inning vs Stanford University in the championship game in 2000. He received the “Johnny Bench Award” his senior year, an award given annually to the best college catcher in the country. He was drafted by the Arizona Diamondbacks and played 6 years in the minor leagues, 4 of them in triple A. He still has that love of the game to this day, as he now runs his own baseball program in his own hometown of Baton Rouge. I would like to conclude my message by telling you why I think you should choose my camp over the many competitors that have popped up in Orange County over the years. The number one reason is our coaching staff. Many of the high school and college camps use their current players to serve as their coaches. Those young kids can not compare to the men that I hire. All my coaches go through a strict background check when they apply for their high school and college coaching jobs. That should be important to you when you turn your kids over to someone you know nothing about. Another reason you should choose us is our track record for success, that I talked about earlier. No camp can compare with our list of distinguished alumni that have gone on to do great things in the major leagues. Lastly, and probably one of the most important to many of you is our price. I have reviewed our fee schedule against all our major competitors and if you figure out how much you are paying hourly for the instruction that you are receiving, we are the cheapest camp while still offering you the best program. When you scroll through the internet and look at the website for each camp you are considering, make sure you look how many days of the week and how many hours in the day the basic number that the camp posts on their site to attract your attention is paying for. We train Monday thru Friday and your weekly fee includes training from 8am through 3:15pm each day. Some camps train less days, some less hours, make sure you don’t get fooled by just looking at a basic weekly number. Every camp has a different idea as to what they consider a “week” of training. In conclusion, I would like to congratulate Cresse camper, Mark Trumbo, for his fantastic season in 2016 for the Baltimore Orioles. Mark Trumbo attended our program from the ages of 6 thru 14. Mark led the Major Leagues in home runs in 2016 when he hit 47 home runs with 107 RBI’s. He recently signed a three year contract with the Orioles for 38 million dollars. I think if you asked Mark’s parents if their investment in their Mark at the Mark Cresse School of Baseball paid off, you might receive a enthusiastic response! Hope to see you at my camp this summer.